I was told to drive about a mile down the frontage road and look for an old gate into a field. I got back in my car and sure enough, there it was, no sign, no parking lot, just a small dirt edge to the road by an old rusty gate, and off in the distance you could a row of old vintage Cadillacs planted nose down in the dirt. 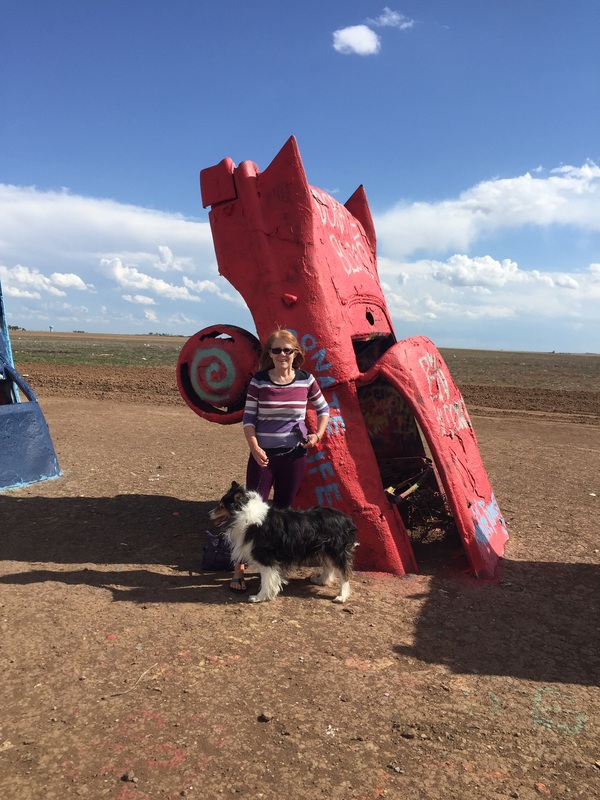 My dog and I got out, in a strong wind that blew the dust from the desolate, empty field into our eyes, and we started the trek across the several hundred yards that led to the cars. Once there, we approached the only other souls who had ventured out in the wind, a young couple with European accents who understood enough English to take out picture. The cars had apparently been purchased by some hippies in San Francisco in the 70’s and moved to Texas when a generous farmer donated the land for their planting. Once there, they have been spray painted over and over by passers by. (Dang, I didn’t have a can of spray paint with me or I could have added my design to the display). 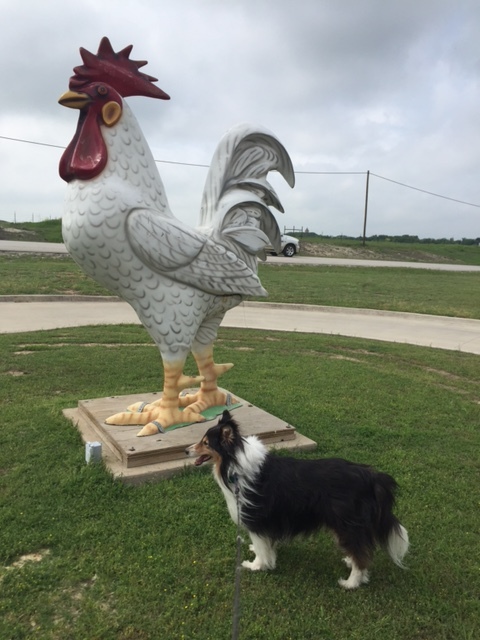 The next day, driving farther east into Texas, I stopped at a gas station for a bathroom break for me and Laddie and encountered in the parking lot of the gas station this giant chicken. No sign, no explanation, just the chicken. I guess everything is bigger in Texas. Then it was on to Dallas where we were fortunate to get to attend the ACMawards50 party for a cause where we got to see many live performances of amazing country artists (that is before everything was interrupted by the severe thunderstorm/tornado warnings). 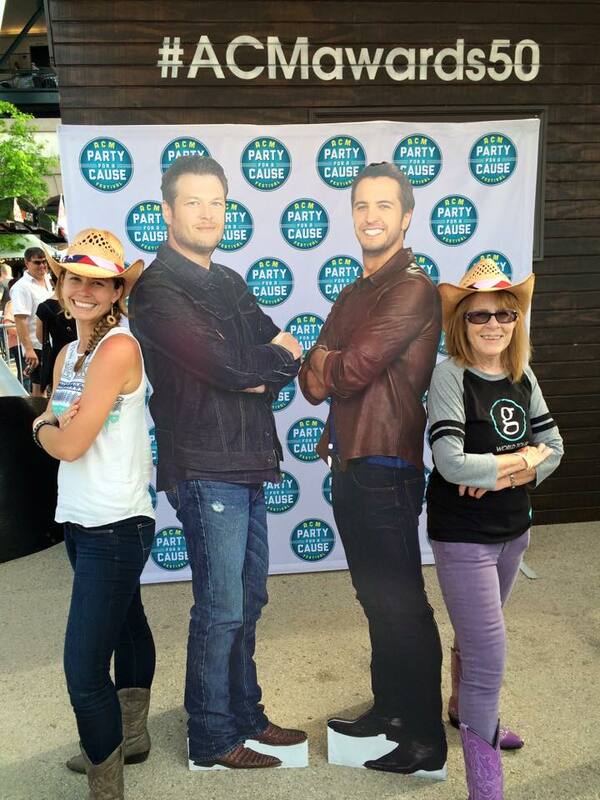 Not to be outdone in the photo op department, there were many opportunities for pictures with life size cardboard cutouts of your favorite country artists. My daughter and I especially liked Blake and Luke! All in all, it was a memorable trip with great photo memories. Its good to be back home. Do you have memorable photos from your last trip? Id love to see them. Vacation starts tomorrow 🙂 Always a happy statement. This time I am especially excited because I am headed to Dallas to see my youngest, Ashley! I haven’t seen her since Christmas, a long time in the life of a mom. So anyway, I’m driving. Its about a 13-14 hour trip. When I share my plans everyone asks “Why?” Not why on the visiting my daughter part, but why on the not flying in 2 hours part. There are several reasons. First, it allows my dog and best friend, Laddie to come along for the ride. Second, I’m not a big fan of flying, not sure why, maybe it has something to do with the feeling of being out of control and for a control freak like me, that’s hard. But probably the best reason is I just like road trips! There is so much to see across our beautiful country, even in those “fly over states” as Jason Aldean so aptly described them. My favorite thing is to stop at every cheesy roadside attraction. The “World’s Largest” anything, always grabs my attention. Every trip to California always involves a stop and photo op at the World’s largest thermometer. We’ve seen the world’s largest giraffe, a real six-legged cow, the world’s largest pop bottle (seriously if you are ever near Oklahoma City, you’ve got to see this-its one of my favorites). 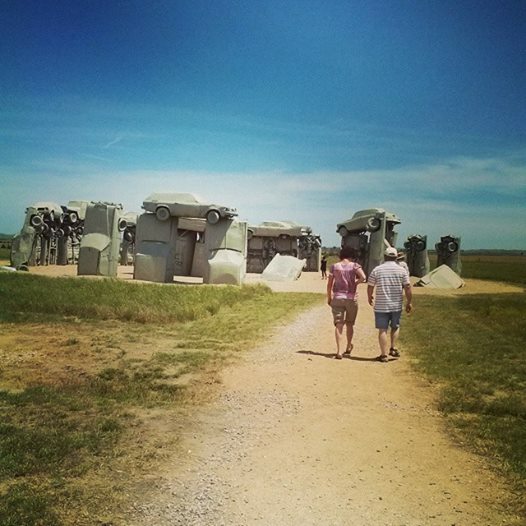 And if you are unfortunate enough to find yourself in northwestern Nebraska, you cant miss Carhenge. 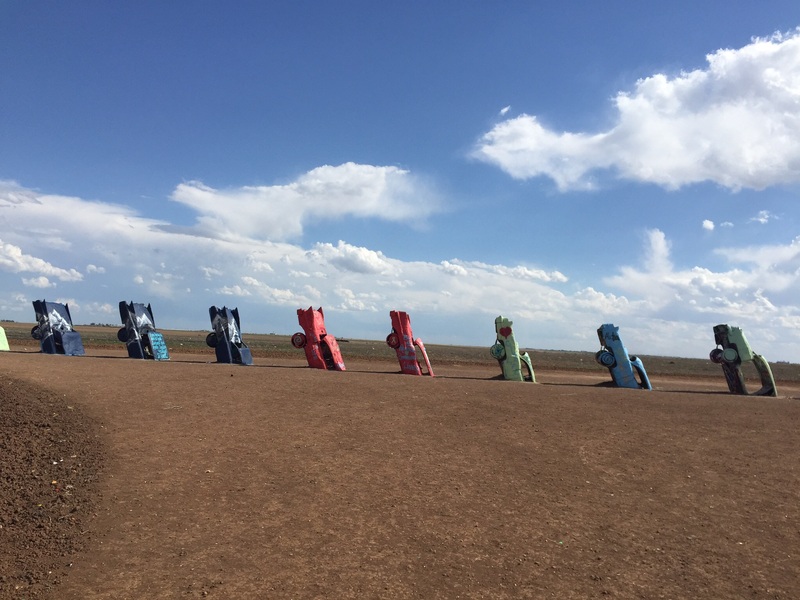 What could be better than an exact replica of Stonehenge, made out of old junk cars (see pic above) I’ve posed in front of giant cowboy boots, teepees and stuffed animals of numerous varieties. So tomorrow begins another excellent adventure. 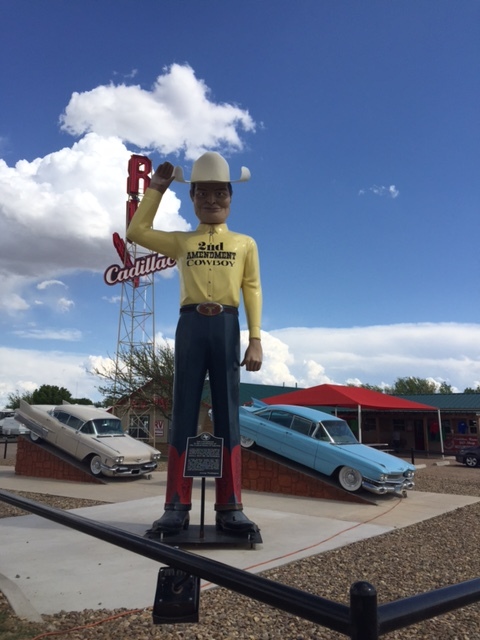 I’m spending the night in Amarillo, Texas, where according to the internet, there is another fabulous site for me to visit. I’m not going to give it away right now, but come back tomorrow for pictures and the whole story. Do you like road trips? What are some memorable sights you’ve seen? I am excited to let you all know that my romance, Colorado Sunset, is part of a wonderful contest that gives you a chance to win a romance a week for the entire summer. What better way to spend warm summer afternoon, than lying in your hammock reading romance. 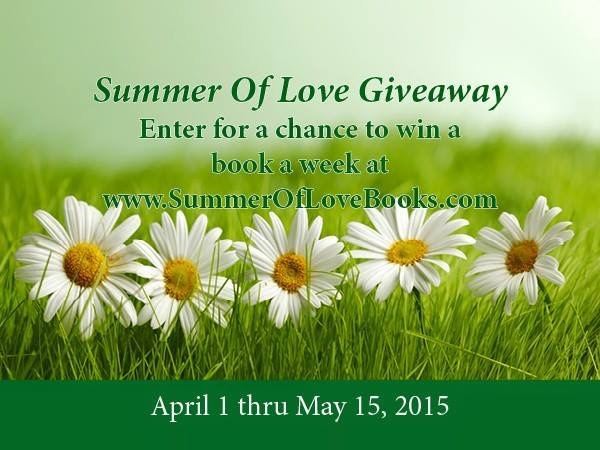 Check out our website, http://www.summeroflovebooks.com, to enter. And if you follow my blog, you will receive an additional entry. I am honored to be part of this site with so many other excellent romance authors. Check out our books and find romance to sweep you away. So as you may know I recently published my first novel, Colorado Sunset, in Ebook format on Amazon. That was the easy part. I paid a wonderful lady (shout out to Lucinda Campbell) to do all of my e-formats for me and they look great. But… then it came to the paperback version. Not finding anyone to do that for me, I plunged ahead. Like plunging into a deep dark ocean, but scarier! I discovered cool features, like drop caps, to make my book look professional. That part was fun. Then I muddled through the front and back matter, not as fun, but not too difficult, or so I thought. Then came the headers, page numbers, etc, and this is where the nightmare really got going. Of course, the odd and even pages had to be different so would be right in an actual book. I would fix one, which would then mess up the other. Fix that and suddenly all the numbers would disappear, or every page in my book would simply be page 2. Finally, after many, many hours I got them all working AND THEN, I added my front matter-title page, dedication, copyright info, and yikes they had page numbers and now my other numbers were all off again. So, after much searching, I learned about sections, if the front pages were “simply” in a different section then I could delete, in theory, the page number from them. Right? Easy enough. NOT. Finally, after several days, and I mean long days, the book looked perfect in Word format, I was thrilled and off I sent it to CreateSpace. First, it wouldn’t even accept my manuscript because there were blank pages, What? Where did that come from? No blank pages in my documents. So back to the drawing board. I could take out those pages, and like magic the page numbers were now back on my front pages! Hours and hours of more playing with it, reading countless proofs and I think a good majority of the errors were fixed before I uploaded it to Amazon. If you order my book, please be forgiving. And the worst part, I really wish I could tell you that I learned so much through this process that my next book will be so much easier. But that would be a lie. To tell you the truth, I have no idea how I did it, it was all dumb luck! Anyone want to format my next book?